“On Friday 13th June, Police executed a search warrant on Buckhurst Road, Levenshulme. A large amount of cash was seized and two men were arrested on suspicion of money laundering”. “Lancashire Folk Tales” is a new book published by the History Press in June 2014. These lively and entertaining folk tales from one of Britain’s most diverse counties are vividly retold by writer, storyteller and poet Jennie Bailey and storyteller, writer, psychotherapist and shamanic guide David England. Take a fantasy journey around Lancashire, the Phantom Voice at Southport, the Leprechauns of Liverpool and the famous hanging of Pendle Witches at Lancaster, to the infamous Miss Whiplash at Clitheroe. Enjoy a rich feast of local tales, a vibrant and unique mythology, where pesky boggarts, devouring dragons, villainous knights, venomous beasts and even the Devil himself stalk the land. Included in the book is the tale of the Levenshulme Boggart. A long, long time ago there was a helpful supernatural being – a boggart – who assisted Old Farmer Dannel in his Levenshulme field. Unfortunately, boggarts are testy creatures, and after Old Dannel thanked the beast for its help it turned upon him! The book is beautifully illustrated by Levenshulme-based graphic designer Jo Lowes and Manchester-based Transylvanian artist Adelina Pintea who bring to life the landscape of the county’s narrow valleys, medieval forests and treacherous sands. Thanks to Levenshulmelife.com for this text. Daniel Pitts, from Levenshulme, has reproduced images of some of the show’s most beloved characters including Hilda and Stan Ogden, Albert Tatlock and Betty Turpin, Dennis and Elsie Tanner. 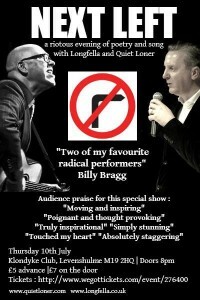 A riotous evening of poetry and song with Longfella and Quiet Loner. Levenshulme Local – A free brochure to promote the shopping experience in Levenshulme, Manchester. Featuring the world’s oldest cobblers, local resident Carl Nunnerley talks food and Masterchef, Danny Pitts – our local High Street artist, five reasons to shop local plus a guide to our traders and much more. Produced by the Levenshulme Trader’s Association Team. GMP invites you to attend surgeries at Tesco Metro on Stockport Road on Wednesday 4th June, 14.00-16.00. At the surgeries you can meet your local officers and raise concerns about crime and anti-social behaviour. You can also tell officers how you feel your community is being policed and receive crime prevention advice on a range of issues.